All I could think of while eating this salad was how sweet and summery it tasted. In a small mixing bowl, mix all the dressing ingredients. Optional: Pour the vinaigrette mixture into a small glass flask with a leak-proof top and shake well. Use the flask to serve. In a salad bowl put in the fennel first. Drizzle vinaigrette over fennel. I like to slow pour a letter “G” onto the salad. Mix well. 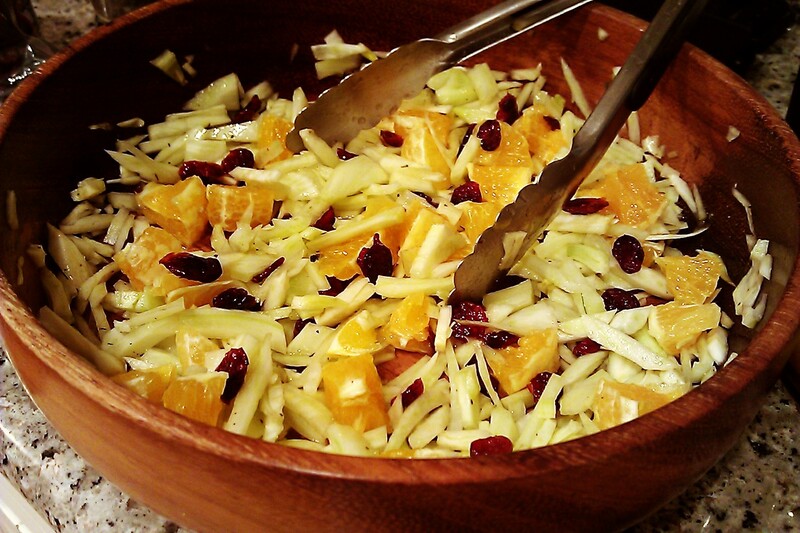 Then top with sliced oranges and dried cranberries. yum! I love fennel salads! LOVE fennel… What a beautiful, and I’m sure yummy, salad! This looks awesome. I am a huge fan of fennel and dried cranberries (separate or together). Thanks, Tammela! I tried this at a food tasting and was surprised at the sweet lemony crunchy flavor combination.